When rain hits your roof, no matter how steep it is, the water simply flows down off of the shingles, onto the drip edge (a metal strip installed under the shingles), and into the back of the gutter. The reason that the front of the gutter is approximately 4 inches from the back is to give water carrying capacity to the gutter and to allow space for the gutter to collect areas of concentrated water flow. Leafproof® was designed with this in mind. There is an “S” curve that runs the length of each 4-foot piece of Leafproof, giving the piece an “upper” and “lower” section. This “S” curve is a natural bending point, which allows the installer to custom fit the upper section of Leafproof® to match the pitch of your roof, enabling the lower section to remain relatively flat. Water flowing off the roof will follow the contour of the “S” curve slowing the speed of the water flow. The water adheres to the contour of the “nose” of Leafproof allowing it to flow down and backwards into the water channel, falling into the gutter and out the downspouts. The scientific principle that allows the flow of water to “adhere” to the contour of Leafproof and flow backwards is called surface tension. LeafProof® is a solid aluminum gutter cover that works on the principle of surface tension. Surface tension can best be visualized by slightly tipping a glass of water and watching the water run down the side of the glass. Leafproof makes surface tension work for you, the homeowner. The patented “S” bend causes the water flow to reverse and churn, which slows the momentum of the water as it comes off the roof. The “S” bend also permits the portion of the Leafproof panel which covers the gutter, to be installed at a fairly level slope. This reduces the speed of the water even more. As a result, when the water flow reaches Leafproof’s water channel, the water flow once again reverses and drains into the gutter. 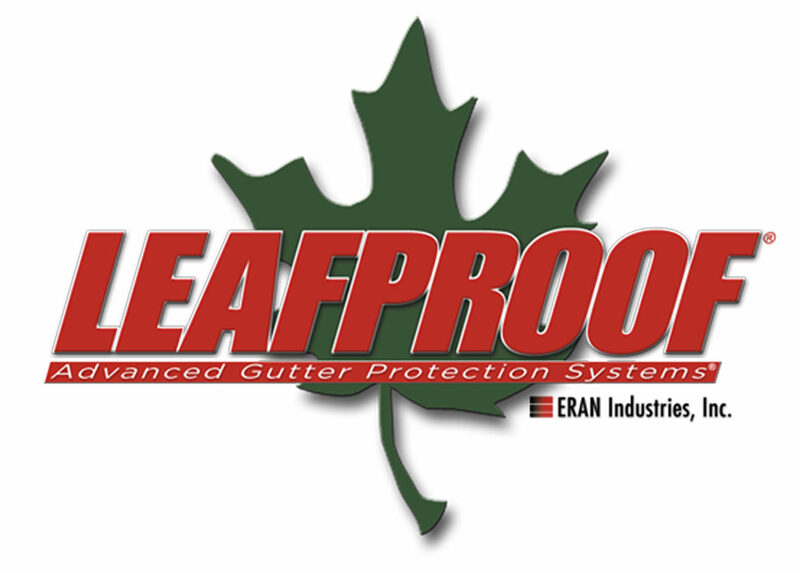 How does LeafProof® prevent leaves and other debris from entering the gutter? If you view LeafProof® from directly above you cannot see LeafProof’s® water channel. When the flow of water reaches the point directly above the water channel, the flow will reverse direction as a result of surface tension, and the water will drain into the gutter. Most debris will not follow this reversal or is blown off the roof by the wind when dry. Will a very heavy rain overflow LeafProof®? No. When properly installed, LeafProof® will handle the heaviest rainfall ever recorded in one hour in America (11 inches). Rainfall this heavy is an extremely rare and dangerous occurrence. (If it is raining this hard, you will not be concerned about your gutters, you will be wondering if there is any room on the “ark”!) In fact, most gutter systems will overflow between 3 to 4 inches per hour. Therefore, manufacturers that advertise their gutter cover can handle 21 inches of rain an hour are misleading because most gutters cannot handle this amount of rainfall. Will LeafProof® work on roofs with steep pitches? Yes, LeafProof’s® patented “S” bend and design will reduce the water’s speed and permit the water to enter the water channel without overflow. Is it important that a gutter cover have a pre-set water channel? No. LeafProof® is made from aluminum, not vinyl. Therefore squirrels and birds cannot chew or peck through a section of LeafProof®. Additionally, unlike some “all-in-one gutter and gutter covers”, birds cannot enter through the water channel because the opening is too small. How can LeafProof® be cleaned from the ground? On RARE occasions, LeafProof’s® water channel may trap some debris. This debris will be visible from the ground and may be removed using a hose with a high-pressure nozzle to clear the water channel of the visible debris. Why is it important that a homeowner be able to clean a gutter cover from the ground? Any product that is placed on the exterior of a home will require some maintenance. For example, windows and vinyl siding must be cleaned. Gutter covers are not an exception. Guttercover manufacturers that claim their product is maintenance-free and will never clog are simply not stating the truth. LeafProof® is the only gutter cover on the market that is installed under the first row of shingles and allows you to perform this necessary maintenance without climbing on a ladder or standing on your roof. Is LeafProof® nailed or screwed into the roof or fascia? No. LeafProof® simply slides under the first row of shingles and the front is securely attached to the gutter lip. Products that are nailed or screwed into the roof may cause serious damage to your roof and may void many roofing warranties. Why is it important that the gutter cover fits under the first row of shingles? The difference in the height of a gutter cover that fits under the second row instead of the first row of shingles on a 5/12-pitch roof is approximately 11⁄2 inches. This difference in height means that the gutter cover is much more visible which detracts from the appearance of the home. LeafProof® fits securely under the first row of your existing shingles and will provide a more finished look to your home’s exterior. Why is LeafProof® installation more expensive than a traditional gutter installation? LeafProof® is custom-installed to fit your roof pitch while most gutters can be formed and measured to length at the job site. Since LeafProof® must be installed under the shingle, a long run of LeafProof® would be very difficult, if not impossible, to install. Therefore, LeafProof® is manufactured and installed using four-foot sections. If gutters were installed four feet at a time, their cost would significantly increase, too. Are more expensive products better than LeafProof®? No. LeafProof® is the only product on the market that: fits existing gutters; is installed under the first row of shingles; is not screwed into your roof or fascia; and can be cleaned from the ground. Competing products are more expensive because increased installation time greatly adds to the cost OR your existing gutters must be replaced. Although some gutter covers can handle more rain than LeafProof®, this advantage is purely academic; your gutter will overflow before it will rain harder than the amount of water flow LeafProof® can easily handle. Why is LeafProof® superior to other gutter protection products? LeafProof® is the only gutter protection product on the market today that: fits existing gutters; can be maintained from the ground; is not screwed into the roof or fascia; and is securely installed under the first row of shingles. There are other gutter covers on the market that work in a similar manner. However, these gutter covers do not have Leafproof’s patented “S” bend. This means these covers must be installed under the second row of shingles and are often screwed or nailed into the roof.